If you picked 1, 2, 3, 4, or 5, you’re right! Congratulations! Nice work! By itself, technology is neither good or bad. In fact, when sitting on a shelf collecting dust it is relatively neutral, indifferent (at least for now). However, if being steered by whim or intent, it transforms into something else — a transformational catalyst with the potential for positive or negative impacts on the world. 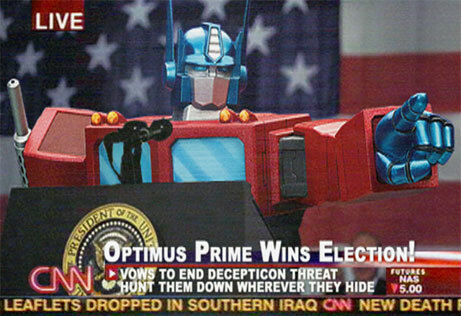 What’s more, once we start using technology to solve our problems with technology, we travel a slippery slope that can only lead to Optimus Prime. Regardless of the where it leads, technology is here to stay. Case in point: In numerous fake studies conducted in my imagination around the world, when given the option between 1. Refrigerated beer or 2. Having to see Rush Limbaugh romp around in a fig leaf, most people chose refrigerated beer. However, there is a more sinister (if accidental) division separating the world from itself — access to resources and technology. While keeping Rush fully clothed is good for the planet, keeping pace with the rapid increase in technological advancements without equalizing global access may not be. Our insatiable appetite for the latest and greatest techno gadgets may well prove to set the stage for an epic battle between the Autobots and the Decepticons. (And just to be clear, we in the developed world are both.) Paradoxically, access is both the good and the bad. For the places that have the latest technology, it has transformed the way people interact with information, problems, and perhaps most importantly, with each other. In fact, the last 10 years of technological developments have already begun to reshape how we look at learning and the future of learning. More and more research is pointing to the positive impact technology can have in shaping learning environments and outcomes. For places that do not have access to technology, the gap separating them from the rest of the world is expanding. The divide between the haves and the have-nots grows exponentially. The problem is that few elect to be the have-nots. In another series of fake surveys in my head I found that most people did not want to be poor, famished, and living without many of the modern conveniences that we in the richest nations take for granted. With the global digital divide a stark and sobering reality for many around the world, those with access are not waiting idly by for the rest of the world to catch up. We see. We want. We get. We toss. Repeat. Often. The more the better. The real problem between the Autobots (technology’s transformative potential in fostering communication and collaboration) and the Decepticons (technology’s transformative potential in how we prioritize our needs vs. wants), is sustainability. Let’s face it, many of the resources we depend on are relatively finite. There is simply not enough for everyone to have everything. And here’s the hard pill to swallow: we who use technology in hopes of making the world a better place — we are as much a part of the problem as those who use it for ill. Check out this quick and easy Footprint Calculator. It gives the results as the number of Earth’s it would take if everyone lived the same. As a point of reference, we’d need 4.3 Earths if everyone lived like me. 4.3 Earths! Uh-oh! Am I Megatron? There’s really no way around it: our frantic pace of advancement and acquisition will one day reach a point of where our increased demand will meet decreased yields — of oil, metal, minerals, and/or places to dispose of it all. I’m not suggesting we abandon ship, don robes, all become possession repudiators and battle against any form of transformer. Far from it. We need transformers (aka: innovation) in order to grow and lessen inequalities the world over. I am suggesting we prepare students for thinking critically, asking questions, working together, and building the skills that matter most for dealing with the problems that I helped (and am helping) to create. For every problem technology solves, another is created. And the world that is coming, is not the world that was or even the one that is now. Things change. Students need to be prepared to learn and adapt, and to be effective agents of change. We, as educators, need to see beyond the textbooks, the standards, the assessments, and even the technology to the greater world beyond. Tony Wagner of Harvard Graduate School of Education, in his new book, The Global Achievement Gap, makes a compelling case for survival skills that our graduates will need to survive in a new globalized economy. I really like how you keep adding to the techno and tech house community. It is awesome. I have already been a long time audience member and thought that I should finally post to contribute. I discovered this Spotify playlist and believe it’s suited to this site and its visitors. http://spoti.fi/2v7a0MA I hope it adds to the community.